HubSpot tools allow for the understanding of your customers’ activities, and permit you to drive content creation based on their needs. Their content optimization system (COS) is part content system, part personalization engine, and the first integrated website, blog, and landing page system to be optomized for mobile out-of-the-box. Fully integrated with every marketing channel, it adapts to each visitor's unique context. HubSpot has been an extrordinarily successful tool for many industries including business services, technology, software, and manufacturing websites around the globe. CommonPlaces is a Hubspot silver certified agency partner, developer and reseller. As a Hubspot partner, it gives us the opportunity to join with you in creating an Inbound Marketing strategy and measure its results. We provide consulting and training with our certified team as well as content management and creation. Once integrated into your site, you will be able to monitor visitor behavior on your site, allowing you to generate email campaigns and workflows for lead nurturing. Analyzes web traffic to ensure marketing efforts are working. Allows marketers to easily create landing pages, calls to action and blogs. 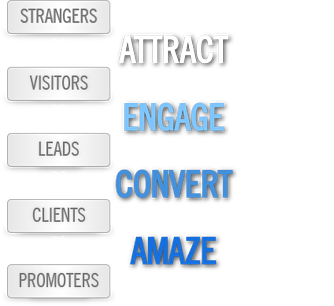 Marketing automation helps with lead nurturing and management. Integrates with social media platforms so sharing blogs, whitepapers, and other content becomes easy and automated.